If you have an outdoor pool you may have considered using outdoor lighting to help illuminate your poolside and brighten up your outdoor space. Products such as electrically powered lanterns, bollards and deck-mounted lights may help to enhance your landscape and may provide a practical solution to your lighting needs. But if you’re looking to create a real sense of tranquillity, why not make your swimming pool the main attraction? Whether you have an above-ground or in-ground pool, there are many pool lighting options to choose from, catering for all tastes and budgets. For those on a budget, simple inexpensive lighting additions, such as using rope lights strung from nearby trees and floating pool lights or candles, can really add a sense of beauty and calm to a poolside area. For those that wish to invest a little more, there is a whole host of lighting options available. As there are so many options available you may find it difficult to decide which pool lighting products will best suit your needs. As a starting point, consider how you intend to use your lighting and how you would ideally like it to be powered. Are you looking to create a ‘wow’ factor that will really make your pool stand out or would you prefer a more subtle lighting effect? When looking to buy, it is worth researching the durability of the lighting options you’re interested in, and to consider the cost of installation, as well as any ongoing running costs. Ask yourself whether you’d prefer fixed lighting, such as deck-mounted lights, or lighting that may be moved – perhaps to easily suit your needs? Consider also the positioning of your lights – would you rather your poolside was lit at ground level, or would you prefer above ground lighting, perhaps by using hanging lights or lanterns? The soft glow of in-pool lighting creates a wonderfully harmonious atmosphere, making your swimming pool a real focal point, particularly as the evening draws in. If you are looking to use lighting to illuminate your pool, it’s important to consider the atmosphere that you’re hoping to create before purchasing your swimming pool lighting. Although above-ground pools do not always have designated light fixtures, owners of such pools needn’t miss out as lights have been developed that attach directly to the walls of above-ground pools, and can fitted fairly easily. As well as providing practical lighting for those wishing to enjoy evening and night time swimming, wall mountable pool lights and floating lights can be used to create wonderful displays of colour. As well as traditional inbuilt pool lights, there are a host of other lighting options, designed to enhance both in-ground and above-ground swimming pools. Below are some examples of the more popular options. Please remember that when installing new pool lights, or changing bulbs, it’s important to consult a qualified pool service technician – in the interest of safety. The standard lighting option for swimming pools is 300W 12v sealed beam, underwater lighting. These lights are reasonably inexpensive, require little maintenance and can be installed in both concrete and liner pools. These lights tend to be fitted to either the sides or ends of the pool walls. Progress in LED lighting has been driven by the increasing importance of some of the advantages that LED’s have over traditional lighting not the least of which is the growing importance of environmental issues and energy efficiency. LED’s convert 90% of the energy that they use into light. They are by far the most efficient light source available. There are, of course, many different brands of LED lighting but we believe that EVA Optic are one of the best. Another good LED option is the Spectravision range of lights that transform any pool into a night time oasis of glowing colourful warmth by combining the vibrancy and brilliance of LED with the soothing effects of colour. The Spectravision lights also can give an ultra white light. 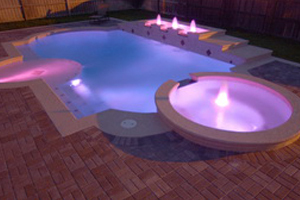 A popular pool lighting system which provides a tranquil ambiance with soothing lighting effects. With this pool lighting system, colour changing and brightness variations are relatively easy to achieve – fibre-optics offer mood-altering effects, which many say cannot be achieved using any other lighting system. As no heat or electricity passes through fibre-optic cables, they’re perfect for use in water and the system itself generally requires very little maintenance. Floating lights can give a tremendous effect and are a great option for those looking for simple, inexpensive in-pool lighting solutions. Suitable for above-ground, as well as in-ground pools, these lights are available in a large range of colours and styles, to suit individual tastes and work well in conjunction with poolside and garden ambient lighting. These lights are generally very easy to install and can be used as free-floating lights or tethered to a fixed point. As solar lights are powered by the sun, they are somewhat dependent on weather conditions. Providing this is not a problem for you, they can prove to be an excellent, inexpensive and highly economical option. If you opt for solar powered lighting, you may wish to consider buying back-up lighting, such as a battery powered light source, which could be used during spells of poor weather. If you would like more advice on lighting your pool you can speak directly to a local, independent pool supplier or technician. Use the links provided above or click here to find a suitable supplier. Have you made the most of your pool lighting? What has worked for you? Let us know about your experiences in the comment box below.